James Duval Phelan was born in San Francisco, April 20, 1861. He was educated at St. Ignatius High School and graduated with an A.B. degree from the University of San Francisco in 1881, followed by a law degree from the University of California. However, he did not pursue a law career, but became a partner in the banking firm Phelan & Son, assuming responsibility of the First National Bank, the Mutual Savings Bank, and the Bank of Santa Cruz County upon the death of his father in 1892. Without previous political experience, Phelan was elected Mayor of San Francisco for three two-year terms beginning in 1897. In the immediate aftermath of the Great Earthquake and Fire, Phelan was an enthusiastic advocate of the plan to relocate Chinatown to Hunters Point. He was president of the San Francisco Red Cross and Relief Corporation, and was designated by President Theodore Roosevelt as custodian of those funds, which amounted to nine-million dollars. He was elected United States Senator in 1913 and served one six-year term. Senator Phelan died at his country estate Villa Montalvo, Montalvo, California, August 7, 1930. 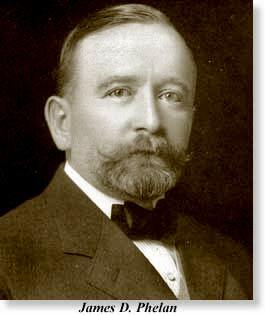 In the aftermath of the earthquake, Phelan toured the United States in 1907 to assure capitalists that San Francisco was a safe place to invest money for the city's rebuilding. Fear that the earthquake, and subsequent graft trials, were injurious to the city's reputation, he gave numerous interviews including one to the "New York Post" which laid out the causes of the graft investigations, and another to the "Boston Herald" where he articulated his rabid anti-Japanese views.